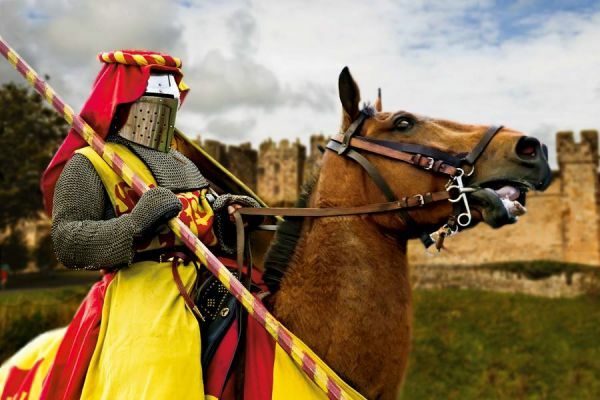 Observe one of Northumberland’s most contested tournaments, with armoured knights engaging ruthlessly in England’s oldest sport! Witness brave and valiant knights battle to defend their honour, displaying great feats of strength, skill and courage! With their lances at the ready, who will be toppled and who will stand victorious? In between these spectacular performances, why not discover more of medieval England? Explore our bustling medieval encampment, learning more of peasants’ medieval crafts and their traditional techniques. From leather work to woodcarving, arrow making and weaving, take the opportunity to observe and handle artefacts of authentic origin. Listen to the gentle wandering tones of traditional songs and melodies, as they would have been performed to the great courts of days gone by. Our performers may even teach one or two young peasants how to play their amazing array of medieval instruments! Observe incredible feats of skill with our live-action longbow demonstrations with the entertaining master archer Andy Rice. Often a weapon which determined the outcome of many medieval battles, discover the techniques required in order to neutralise your target. Witness an exquisite display of obedient horses demonstrating the movements, airs and graces, that have made dressage as we know it today! Listen to spoken commentary by international dressage trainer Peter Maddison-Greenwell and learn more of English dressage’s evolution throughout the ages. This incredible Bank Holiday extravaganza, between the 25th and 27th of May, is free with admission to Alnwick Castle!